Until very recently, Turkey was content to let Islamic State run wild in Syria. The Islamic State in Iraq and Syria (the Islamic State, or IS) has been the number one target for the world's democratic nations since it captured large swaths of land in Syria and Iraq last summer and declared caliphate under sharia law in the lands it controls. The United States and its allies have been waging a war against IS at a distance. So is NATO ally Turkey, at least theoretically, and not at a distance. In reality, things are a bit different. Especially since the beginning of this year, several press reports in local and international media outlets told chilling stories about how jihadists move freely and recruit fighters in some of Turkey's biggest cities. "It is no secret that Turkey has become a fertile ground for jihadist activity. Turkey says it fights IS. Maybe it does. But just randomly and reluctantly," said one EU ambassador in Ankara. Last month a news report detailed stunning revelations of Huseyin Mustafa Peri, a Turkish citizen who joined IS in September but, after being shot and wounded, was captured in early June by Syrian Kurds. He explained the recruiting process with chilling clarity in a video. 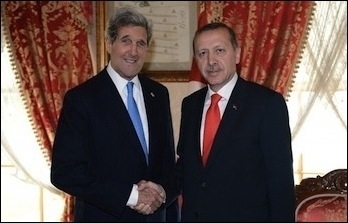 U.S. Secretary of State John Kerry has effusively praised Turkish President Recep Tayyip Erdogan's contributions to the fight against IS. The father of the suspect said he had contacted the police when his son disappeared in October 2014. He said that he suspected that his son, who expressed strong jihadist opinions, could have gone to join IS. The family even pleaded with Prime Minister Ahmet Davutoglu for help. Later, officials told him the young man had joined IS. Strangely, shortly before he detonated the bombs, the young man -- known only by his initials, O.G. -- was briefly detained at the rally due to some conscription irregularity. The police released him, even though their records should have listed his name as a "lost person in connection with terrorism." Officials later explained that there was some procedural error that caused the bomber to be released. Not many people were convinced. Turkey's fiercely pro-government media went a bit too far in revealing where Ankara stands in Syria's civil war. "Turkish Pravdas" ran the stories and headlines praising IS and condemning pro-Kurdish fighters in northern Syria who fought the Islamic State with the help of US-led air strikes. One daily, Sabah, which openly supports President Recep Tayyip Erdogan, ran the headline, "YPG (a Kurdish militia) is more dangerous than ISIS." Other notoriously pro-government newspapers such as Star, Yeni Akit and Aksam ran similar stories. That is no doubt "good journalism" for Turkish officials. But not every Turkish journalist is necessarily a good political scientist. Last month, three journalists at the border with Syria were briefly detained for angering the local governor by asking questions about possible infiltrators from IS. The three journalists, from the Turkish dailies Cumhuriyet and Evrensel and Germany's Die Welt, were taken to a police station for interrogation on orders from the governor. The Turkish state helps IS. Not just with its police force and local governors and other officials in Ankara. Recently, two Chechens, who were accused of beheading three priests in Syria two years ago, avoided sentencing on murder charges, although an Istanbul court sentenced them to 7.5 years in prison for being members of a terrorist group. The jihadist Chechens, Magomet Abdurakmanov and Ahmad Ramzanov, were captured in Istanbul in early July. The court refused to hand down a murder sentence on the ground that "the crime was not committed against Turkey and the lack of an agreement on extraditions." Now the Chechens will serve only two years in prison, due to the Turkish penal code, which automatically lowers prison sentences. A police report said Abdurakmanov might be one of the militants seen in a video that was uploaded on YouTube, which allegedly shows the beheading of the priests. Revealingly, Abdurakmanov told the court that he had received support from Turkish intelligence when he was in Syria. "Turkish intelligence would not help me if I were a member of al-Qaeda," he said. "We were in contact with Turkish intelligence all the time. Turkey sent us arms, cars and money when we were fighting in Syria. Turkey was helping us because we were fighting against [Syrian President] Bashar al-Assad." More recently, an interview with a discontented nurse was published. The nurse, an Alawite (an offshoot of Shiite Islam), claims to work clandestinely for a covert medical corps in Sanliurfa, a southeastern Turkish city bordering Syria. The nurse divulged information about the alleged role that Sumeyye Erdogan, President Erdogan's daughter, played in providing extended medical care for IS's wounded militants who were brought to Turkish hospitals. "No sooner did they become cognizant of my faith," she said, "then the wave of intimidation began. I knew many things... who was running the corps. I saw Sumeyye Erdogan frequently at our headquarters in Sanliurfa ... I am indeed terrified." 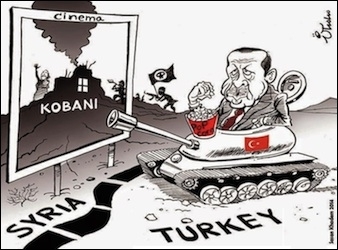 Meanwhile, Turkey keeps on telling the world how it fights the IS terrorists in Syria. Even more ridiculous than this claim is that some people apparently buy the Turkish fairy tales. In April, US Secretary of State John Kerry underlined that Turkey was an essential partner of the US in the fight against IS and praised Turkey's contributions. "I want to emphasize this afternoon the importance of the ties between the United States and Turkey, particularly the security relationship at this particular moment," Kerry said after a meeting with his Turkish counterpart. So it is natural that the Turks think they can always fool their allies: they help jihadist terrorists and in return get pats on the shoulder.